It's a beautiful thing. Some yarn is clearly meant to be something basic. For instance cotton is usually a blanket, dishcloth or sweater. Cascade 220, as much as I love it, is usually a felted bag or maybe a sweater or scarf. But some yarns are just beautiful works of art waiting to break free. I hear that some sculptors will stare at a block of rock for days trying to determine the sculpture waiting to come forth from the rock. My purple yarn is one of those rocks. I bought this yarn to make my scarf for the ISE but it was definitely too thick for the Matthew scarf. I tried several other patterns but nothing was quite right. 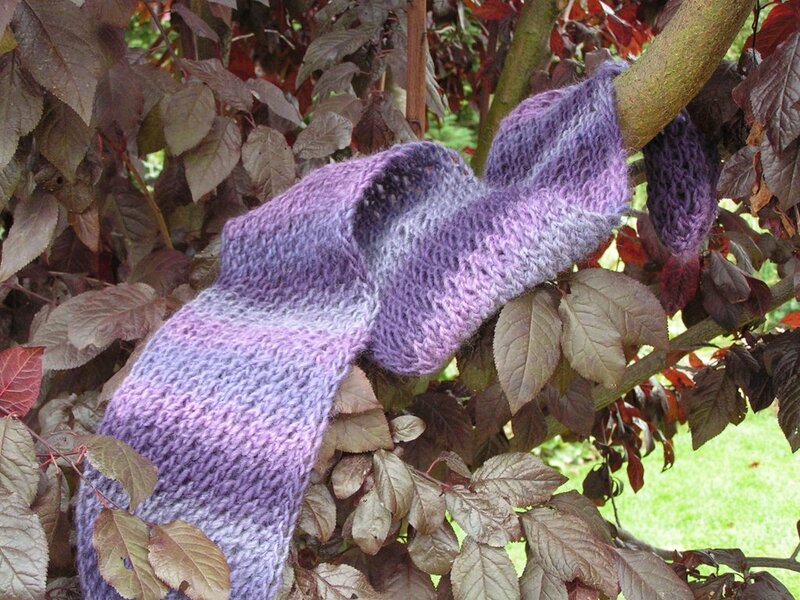 I couldn't bring myself to return the yarn as I loved it too much so I bought the Koigu for my Matthew scarf. Then one night surfing the web I found a description of the turkish lace stitch. It said it was lace for the lace impaired. That is definitely the truth. Well I tried it out and viola - mu Turkish Delight Scarf was born! I believe I have found the true calling of my purple skeins of yarn. I am so happy with this scarf which is destined to be a Christmas present. However I love it so much I'm making one for myself! That purple color is beautiful! What kind of yarn is it? Oh yes that is beautiful. I did a shawl out of that lace pattern. Where can I find directions for the Turkish Lace Stitch?